The First Angled-Knob Bat Ever Used in an MLB Game Goes to Cooperstown. ST. LOUIS (Oct. 13, 2011) – Two baseball bats featuring an ergonomically correct angled knob were recently accepted into The National Baseball Hall of Fame. The bats were first used in an official MLB competition on Sept. 5, 2010 by then New York Mets infielder, Mike Hessman, who hit a double to the left field wall at Wrigley Field in a game against the Chicago Cubs. “I’m shocked and excited. It’s a blessing to be part of history. I’m glad I decided to use it that day,” said Hessman after learning of the significance of his stand-up double with the new ProXR design. “The bat felt great in the game. You always feel better when the bat feels good in your hand,” said Hessman. Five days after Hessman’s hit, Milwaukee Brewers’ Prince Fielder successfully used the same ProXR angled knob technology in a series of games. St. Louis-based designer and inventor Grady Phelan developed the patented ProXR™ angled-knob bat technology to improve grip, performance and bat speed. “Seeing Mike Hessman hit a double with my ProXR bat was tremendous validation for this new design. Having that bat accepted into the Baseball Hall of Fame is a huge honor,” said Phelan. The ProXR angled-knob bats that were accepted into the Baseball Hall of Fame are 33.5 inches in length, weigh 31 ounces, and are all-black custom finished maple bats produced by Wisconsin-based RockBats, LLC. Interestingly, these bats bear the name of New York Mets starting catcher Josh Thole. 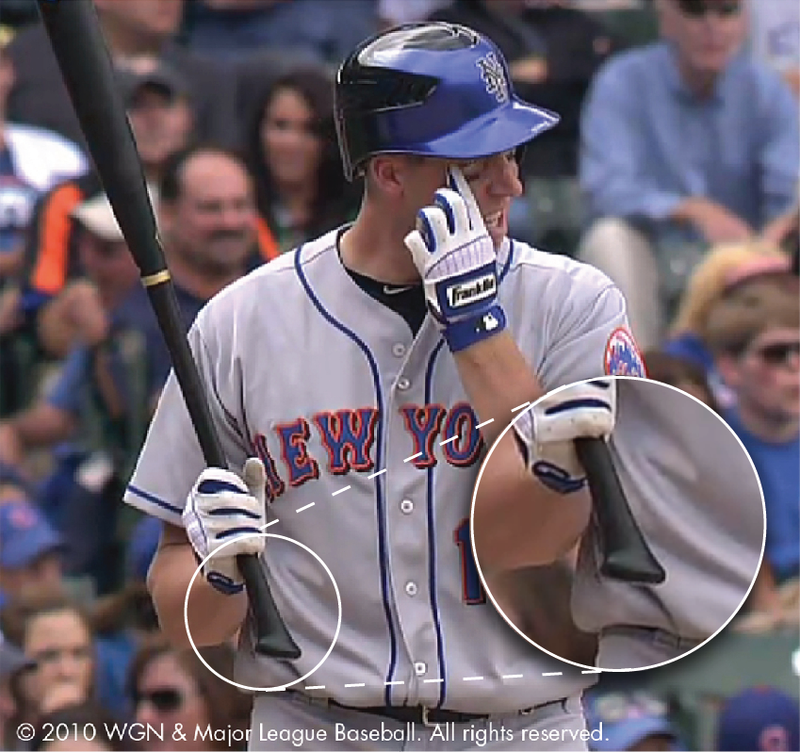 Thole brought the two bats to batting practice at the start of the Cubs series where Hessman first tried them. The creation and development of the ProXR angled-knob started in 2004 after a bat slipped from Phelan’s hands, nearly hitting his youngest son. Since then, Phelan has refined and tested the ProXR design with players at all levels of baseball. He has conducted testing at a prestigious medical university to determine the efficacy of the ergonomic design and has recently made the bats available for sale to the public. The ProXR angled-knob bat design was approved for use in professional and collegiate baseball in 2006. The ProXR design was granted a U.S. patent, #7,744,497 on June 29, 2010. Most recently, Phelan’s ProXR bats were awarded “Best New Product of 2011” at January’s American Baseball Coaches Association convention. The two ProXR angled-knob bats that are now in Cooperstown.